Ballymena United manager David Jeffrey was a happy man after his side saw off Ballinamallard United 1-0 on Saturday thanks to a Tony Kane penalty. 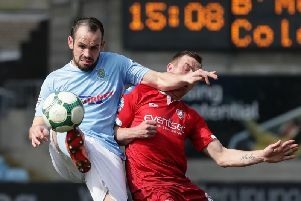 It was the Sky Blues’ first win in the Danske Bank Premiership this season after a 6-0 defeat to Crusaders on the opening day and a 3-3 draw with Glenavon during the week. United created plenty of chances against a Ballinamallard team who struggled to create anything of note themselves and Jeffrey admitted one thing made him a very happy man. “Then five minutes later I wanted half-time to come because we were 3-0 down and then 4-0 down at half-time before losing 6-0. “But that experience was embarrassing for the players and very harsh. “So coming down here today I asked the players for a clean sheet.